Excerpt: Dear Madam, We take this opportunity to thank you most sincerely for your kind donation of Rs. 20,000/- (Rupees Twenty Thousand Only) by ICICI Bank. We take this opportunity to thank you most sincerely for your kind donation of Rs. 20,000/- (Rupees Twenty Thousand Only) by ICICI Bank cheque no. 383598 dt. 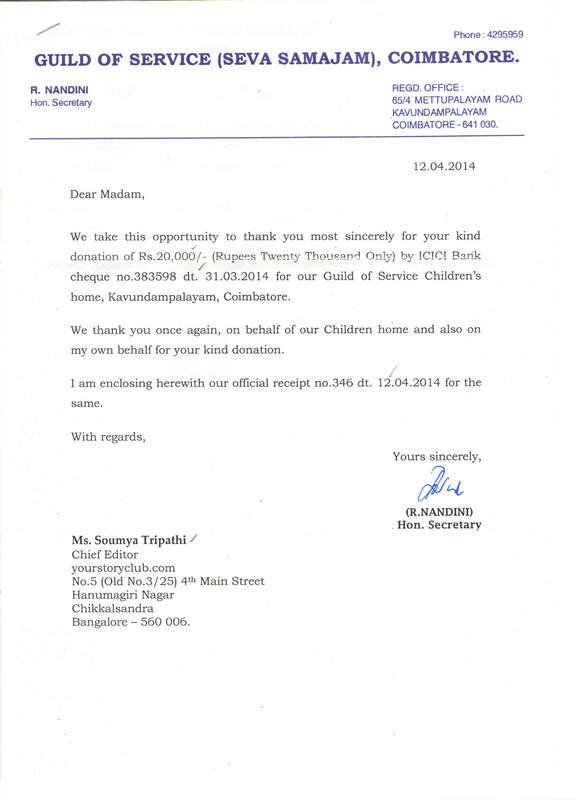 31.03.2014 for our Guild of Service Children’s home, Kavundampalayam, Coimbatore. We thank you once again, on behalf of our Children home and also on my own behalf for your kind donation. I am enclosing herewith our official receipt no. 346 dt. 12.04.2014 for the same. We started YourStoryClub.com website to support budding and upcoming writers, and help needy by monetary benefit earned. As a part of our mission we conduct many creative writing contests, publish literary work and encourage writers to donate prize/earning to our initiative to help the needy. We would like to donate such contributions to your noble mission Guild of Service. In this regard kindly find enclosed cheque of Rupees Twenty Thousand (no. 383598, dated 31 Mar 2014) in favour of Guild of Service, Coimbatore payable at par at any branch of ICICI Bank. We thank you for the noble mission Guild of Service, and feel privileged to associate ourselves with it.